I love walking into the house and finding Victor in the kitchen. It always means we’re in for a gastronomic treat. I tend to get most of the credit for cooking, but Victor is a fantastic cook. It’s not unlike when Ruth and I worked together. Being the showman, I tended to get a lot of the credit for things, but it was Ruth who consistently came up with the brilliant ideas. And it happens at home, too. 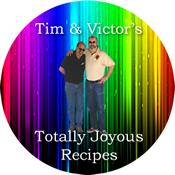 Victor and I are very different cooks, but we’re fortunate that we like to do different things. We have different “patience levels” and generally complement one another’s styles. 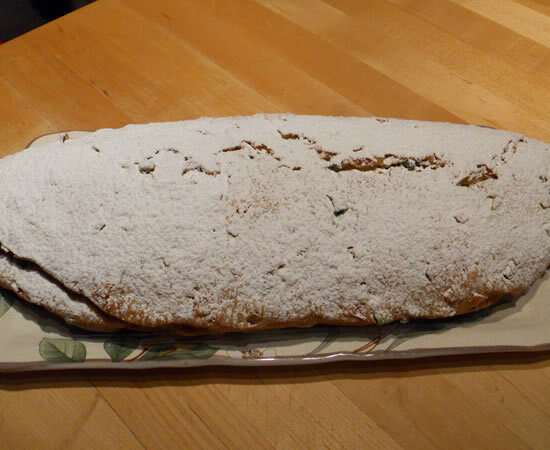 Walking into the kitchen, I was greeted with a very slowly-rising Christmas Stollen! 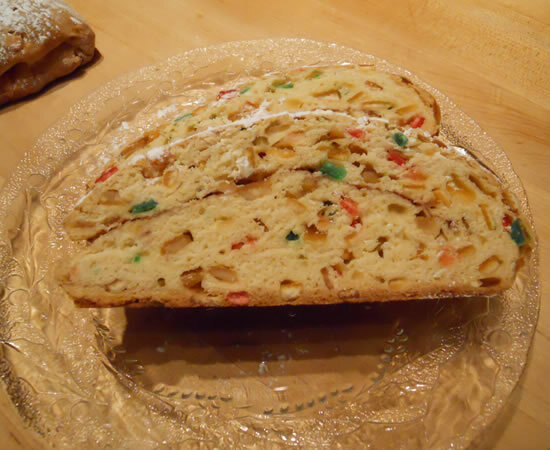 I love stollen but hadn’t made my favorite Stollen recipe from our friend Luigi this year. That recipe makes about 8 loaves. Victor found another recipe online and decided to give a single loaf a try. I had a container of fruitcake fruit – I hadn’t made my fruitcakes or Christmas Pudding, either – so he used that along with some raisins. The recipe calls for a marzipan center. We did have almond paste in the cabinet – for the amaretti I didn’t make – but he decided to go without. The original recipe comes from the Dorchester Hotel in London… Victor’s heading off to London in a couple of weeks and will be staying in Mayfair not far from the Dorchester… (I’m not jealous. Really. I’m. Not. Jealous.) But I digress… Perhaps he can pop in and see if they have any available at High Tea… Or something. It’s a very dense dough and doesn’t rise the same way as a traditional yeast bread does, so don’t panic if it’s not looking exactly how you think it should. It should still come out just fine. We had two power outages while this was in the oven and it still came out perfect!